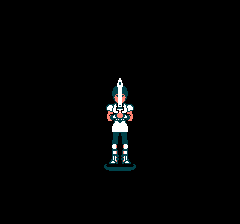 You are currently browsing the archive for the NES category. This game is by Tokyo Shoseki – the same people who published Elysion and a classic action RPG called Romancia. Snark has a beta translation out, with some truncated lines of text. The game is a text adventure game with real time side scrolling boss fights. Considering the game came out in 1989, the game is pretty ambitious. Choosing to enter a dangerous spring causes a rare death within the text adventure portion of the game. This NES game came out in 1990 from Konami. It’s based off of a manga series which was notable for trying to emulate a “Western” style of plot and layout. The story is fairly simple. Your hero, Madara, was dismembered by an evil general, and was found in a river by an old man. He recreated Madara’s limbs with “gadgets” and raised him as his son. Meanwhile, the missing body parts are held by powerful generals. When the old man, Tatara, dies, Madara strikes out to regain his true body parts and to end the Moki invasion. 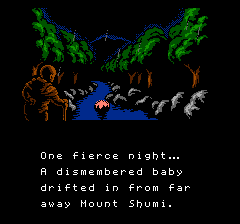 The introduction shows the hero drifting down a river. Bloody Warriors came out in 1990 from Toei Animation. 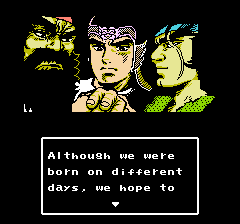 The game was never released in English, but there’s a very rough partial translation released by Dodgy Translations. From what I could tell, the Japanese version of the game has a surprisingly simple menu system. On average, you have only one or two choices when you pick something from a menu, and the main menu is only three options. Each area of the game offers one set of equipment in the early game, and there’s really nothing other than hitting or healing in normal battles. However, there are some interesting elements, no matter how simple this game may appear. 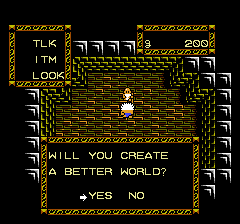 The elder asks the hero (with the white hair) if he will create a better world. This game came out in 1987 from Namco (credited as Namcot on the game cover.) 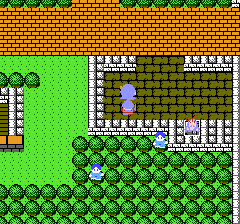 It’s a typical action RPG in the style of Faxanadu with a day / night cycle like Castlevania II. Gil-Galad worked on a translation with Steve Martin and it was released recently. 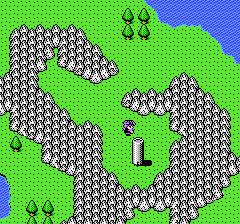 In the intro, a schoolboy turns into a soldier in white and then starts the game outside the first town. 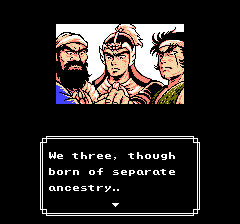 Kaijuu Monogatari came out in 1988 for the NES, and there were two sequels on the SNES. King Mike made a translation of the game, however it seems to have some issues with spelling errors and glitches. Due to the difficulty of applying the translation, I can’t promise if newer versions of the translation has less errors. 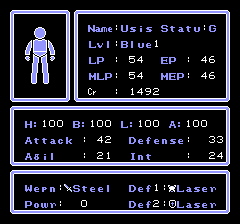 However, it’s perfectly playable in the current state, and definitely isn’t as bad as the translation for STED. This is the first town in the game. You can give the old man on the right some water so he'll let you use the basement stairs.